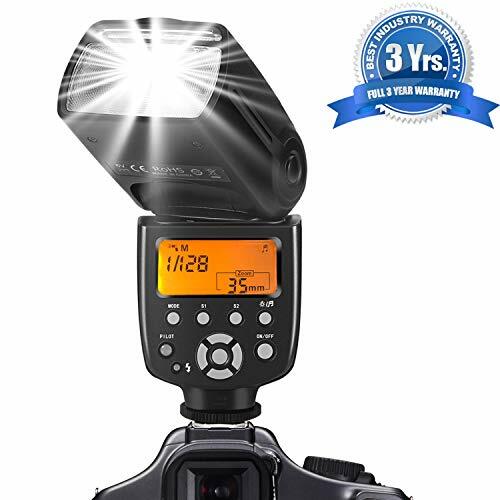 Godox Hot Shoe 36pcs Dimmable Ultra High Power LED Video Light Lamp for Canon, Nikon, Pentax, Panasonic, SONY, Samsung and Olympus Digital SLR Cameras W 1/4"
Note: Batteries aren't included. Please read the instruction manual carefully to ensure that you can use the product properly and safely. 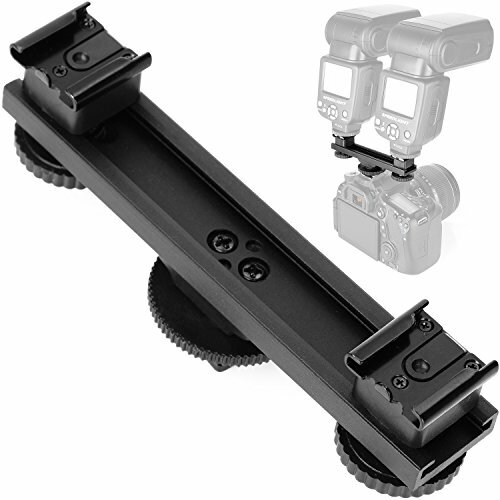 ChromLives Hot Shoe Extension Bar Mount Dual Flash Bracket Equipped with movable 1/4" screw and detachable shoe mount. Built-in 1/4" threaded hole for tripod, light stand, handle grip and other support. 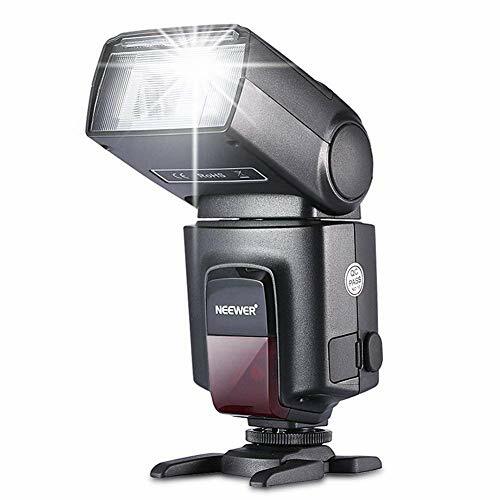 Dual hot shoe mount is perfect for mounting two flashes simultaneously. Note, Not for large led light or microphone. It is compact, easy to use. Specification: Material:Aluminum and hard plastic Size: 4.7*1.2*1 inch Adjustable Range (Between two hot shoe mount): From 2.95 to 3.33 inch Weight:58.6g/0.13lbs. 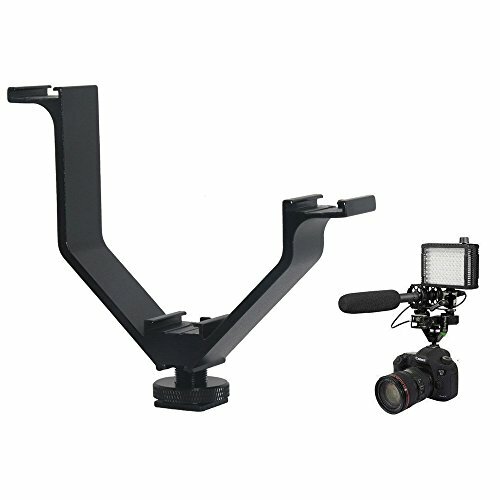 Color: black Features: -Equipped with movable 1/4" screw and detachable shoe mount.Built-in 1/4" threaded hole for tripod, light stand, handle grip and other support. 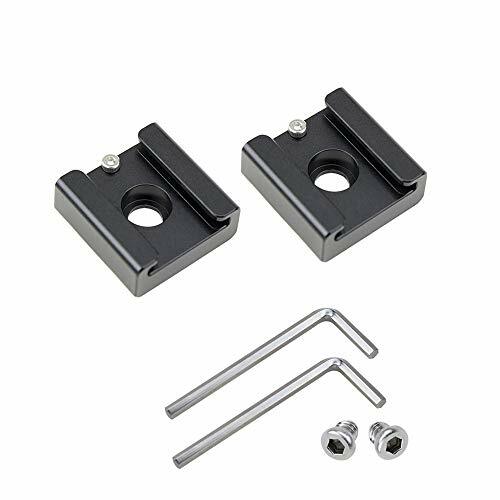 -Easy to set up and remove, Chromli ves hot shoe extension bar mount can be a great and affordable addition to your camera.- Suitable for Canon Nikon Sony Pentax Olympus DSLR Camera, camcorder, flashes, lights, DV camera, LED video Flash. -Anodized matte treatment to add increased protection and be of corrosion resistance. Package includes 1X ChromLives Hot Shoe Extension Bar Mount Note: Camera flash microphones are not included. Anwenk Cold Shoe Adapter Standard Shoe Type with 1/4" Thread Hole for Camera DSLR Flash Led Light Monitor Video,5 Pack Solid made cold shoe adapter to mount hot shoe accessories like shoe mount handle, cold shoe block for camera DSLR monitor,flash led light video microphone ,camera cage,cheese handle and any standard shoe mount accessories. 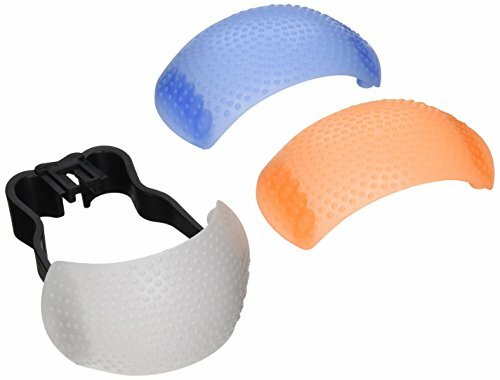 This cold shoe adapter is more functional and professional than previous version, because this cold shoe is with extra two M2.5 unthreaded holes to keep it in place without moving around. With a stop screw on the cold shoe to help position your hot shoe accessories without sliding forward.Made of solid aluminum alloy, black anodized treatment for higher durability.Precise CNC machining. 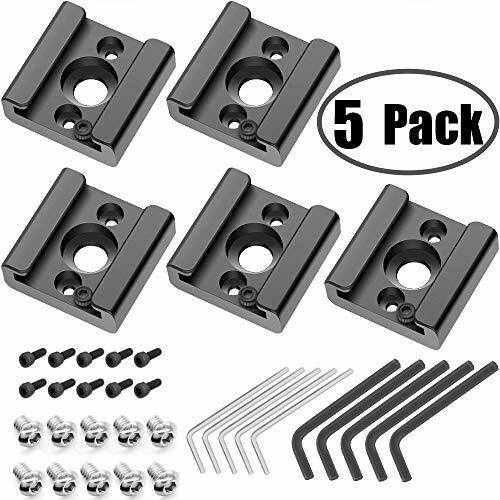 Package Includes: 5* cold shoe mount;10* 1/4" Screw Adapter(short and long); 10* M2.5 Screw Adapters;10* Hex Spanners. Material: Aluminum Alloy. Net Weight: 0.35oz. Please note, this item ships from an international seller. Expected delivery is 10-15 days. 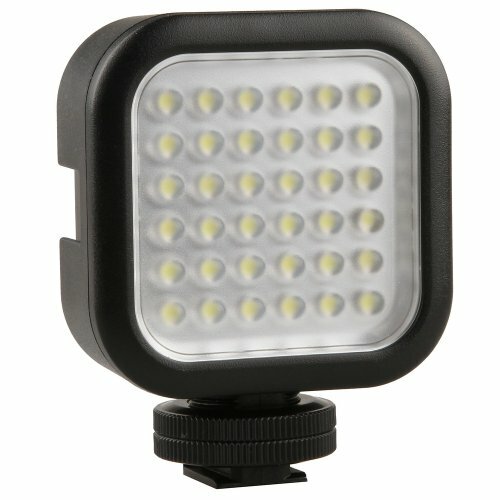 International ShippingGodox LEDP120C LED video light is an ideal helper for your photography or video shooting. Ultra-thin design, 12W high power even soft light, 3200~5600K stepless adjustable color temperature. 10%~100% stepless adjustable brightness, CRI>95 ....making it easy for you to find the best lighting condition. 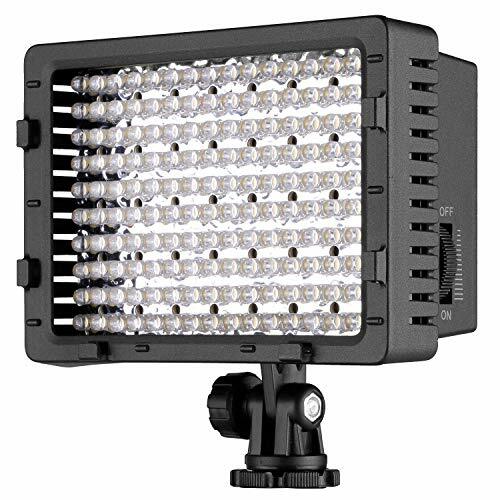 The hot shoe mount supports handheld, on-camera/on light stand(1/4" screw mount).Features:116pcs high quality and ultra-bright LED beads, max.12W output, offer bright, even and soft light.CRI>95,TLCI>95, 3200K~ 5600K stepless adjustable color temperature, 10%~100% stepless adjustable brightness, find the optimal lighting effect.With 1/4" female screw on the bottom, comes with a 1/4" hot shoe mount, support handheld, on-camera and on-light stand(1/4" screw mount ).You can adjust the lighting angle through the hot shoe mount.Compatible for NP-F970 model 7.4V lithium battery. (Sold separately. )Compact construction, ultra lightweight, portable to carry.Wide range of louver for quick heat dissipation, prolong service time.Ideal for photography for wedding, press interview, still item, video shooting, micro-shot and etc.Specifications:Brand: GodoxModel: LEDP120COutput: Max.12WColor Temperature: 3200K ~ 5600K (+-300K)Brightness(LUX): --580 (0.5m/4500K) --630 (0.5m/3300K) --680 (0.5m/5600K)Light Brightness Range: 10% ~ 100% AdjustableColor Reading Index(CRI): >95TLCI(Qa): >95LED Beads Quantity: 116pcsCompatible Battery Type: 7.4V NP-F970 Lithium Battery (Purchase Separately. )Operating Temperature: -10℃ ~ 50℃Light Size: 17.5 * 13.1 * 1.7cm / 6.9 * 5.2 * 0.7inLight Weight: 233.5g / 8.2ozPackage Size: 24.3 * 13.8 * 3.3cm / 9.6 * 5.4 * 1.3inPackage Weight: 365g / 12.9ozPackage List:1 * LED Light1 * Hot Shoe Mount1 * User Manual(English/Chinese)Note:Only the light is included. Please note, this item ships from an international seller. Expected delivery is 10-15 days. 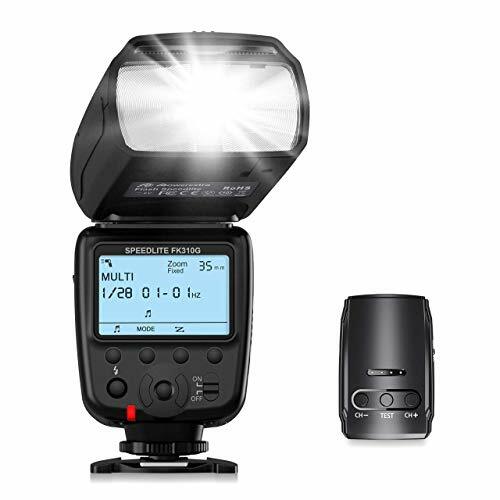 International ShippingFeatures:Portable, mini digital slave flash for cameras.With universal hot shoe, can work with any digital cameras.200 flashes on fresh set of 2 AA alkaline batteries.Auto Pre-Flash Sensor.Built-in Digital Slave.Usage:1. Put two AA batteries into the flash light, then close the battery cover.2. Long press 'POWER' button for 3s, can startup the flash. The default startup mode is M mode. Press 'PILOT' button, can test flash light.3. After use, long press 'POWER' button for 3s, can be powered off, remove the battery if unused for long periods.Specifications:Brand: AndoerModel: WS-25Material: PlasticColor: BlackGN: 18Recycle Time: 3 secondsPowered By: 2 * AA battery (batteries not included)Item Size: 8.5 * 5.9 * 2.6cm / 3.3 * 2.3 * 1inItem Weight: 61g / 2.2ozPackage Size: 9 * 6.8 *4.6cm / 3.5 * 2.7 * 1.8inPackage Weight: 83g / 2.9ozPackage List:1 * WS-25 Slave FlashNote:Batteries and camera are not included.Never reverse the polarity when installing batteries. The Nikon BS-1 fits into the hot shoe of all Nikon SLR cameras and helps to keep out dust and moisture from the hot shoe. 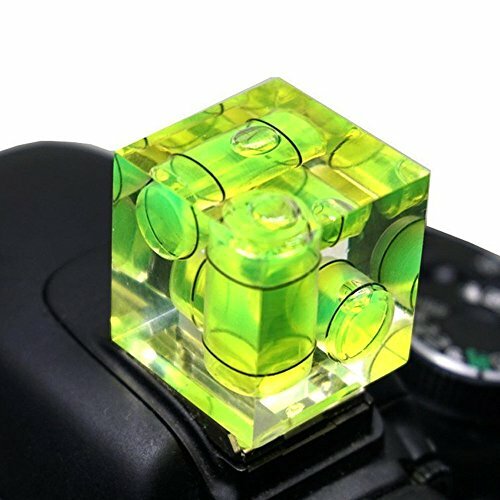 "Small, Lightweight, accurate, easily stored - just slide the bubble level cube into your cameras hot shoe. Together with a tripod, horizons are easily leveled. This 2-Axis Spirit/Bubble Level makes it easy to line up great shots. Simply put it into the camera's hot shoe/flash mount and check the three bubbles. All lined up? Shoot! 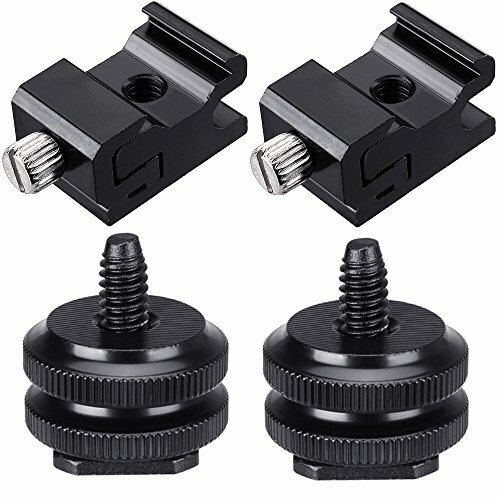 Fits most standard flash mounts on SLR or DSLR cameras." Please note, this item ships from an international seller. Expected delivery is 10-15 days. International ShippingThank you for purchasing Andoer 4K Ultra HD digital video camera. It can be used to shoot video as well as taking photo separately. Featuring max. 4K(2880 * 2160) video resolution, 30MP image resolution, 16X digital zoom, 3.0"" LCD touchscreen, IR night vision function, WiFi connection, hot shoe mount for external microphone. Features: Adopts for Panasonic 34110 high sensitivity CMOS sensor, max.4K ultra HD video resolution and 30MP(interpolation) super clear image resolution, 16X digital zoom, 3.0"" rotatable LCD touchscreen, with it, you can capture any wonderful moment freely. 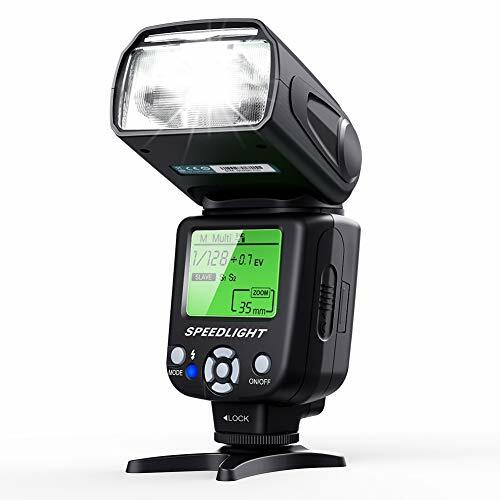 Supports video/ interval video/ slow-motion video/photo/ interval photo/ continuous shoot modes, making your shooting more various and more free; and its IR night vision function makes it perform natural and high definition records in dark environment by turning on IR light. Supports WiFi connection, you can share videos and photos to your friends or families via the APP downloaded on your smartphone; and the camera also can be connected with your computer and used as a PC camera for live streaming. Designed with hot shoe mount for connecting external microphone, which is convenient for outdoor activities, conference and teaching recording; can connect 37mm external wide angle lens to get a wider sphere of view and more vivid pictures. (external microphone and lens are not included) Specifications: Brand: Andoer Color: Black Sensor: Adopt for Panasonic 34110 CMOS Sensor, max.30MP(the interpolation) Memory: Support SD Card, max. 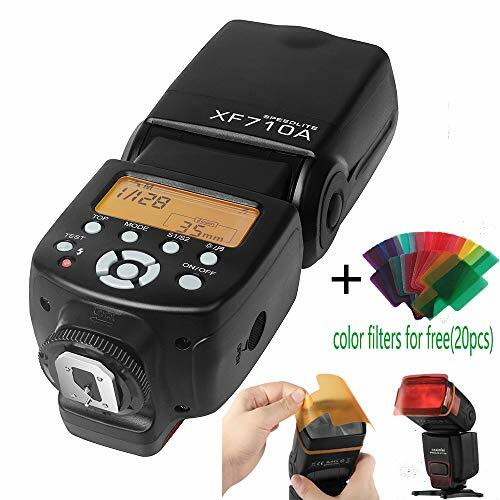 to 128G (Not included) Lens: f=7.36mm, F NO: 3.2 Focus Distance: 1.5m to infinity Screen: 3.0"" touch IPS-LCD(16:9) Video Format & Resolution: MOV, 4K: 2880*2160(24fps),2.7K: 2688*1520（30fps）,2K: 2304*1296(30fps), FHD: 1920 * 1080(120/60/30fps), HD: 1280 * 720(120/60/30fps), VGA: 640 * 480(30fps) Image Format & Resolution: JPEG, 30M/24M/ 20M/ 14M/ 12M/ 8M/ 5M/ 3M/ 2M/ 1.2M/ VGA Function: 16X Zoom, WiFi connection, Night Vision, hot shoe, multi-snapshots(2/3/5 photos), built-in speaker, built-in microphone White Balance: Auto/ Daylight/ Cloudy/ Tungsten/ Fluorescent/ Fluorescent 1/ Fluorescent 2 Exposure: ±2.0EV Self-timer: off, 2s, 5s, 10s, 15s, 30s Auto Power OFF: OFF/ 30s/ 1min/ 2min/ 3min/ 5min Interface: USB2.0, HD interface, 3.5mm MIC interface Operating System: Support for Windows 98/ 98SE/ ME/ 2000/ XP/ Vista/7/10 Language: English/ French/ Spanish/ Portuguese/ German/ Italian/ Simplified & Traditional Chinese/ Russian/ Japanese/ Korean/ Polish, etc Power Supply: 1 * NP-40 Li-ion Battery 3.7V 1500mAh(Digital Video Camera) Remote Control Battery: 1 * 3V CR2025 Battery Item Size: 12 * 6 * 5.5cm / 4.7 * 2.4 * 2.2in Item Weight: 315g / 11.1oz(With battery) Note: Memory card is not included, and class 10 or above is highly recommended to ensure camera smoothness. Please remove the plastic sticker on battery of the remote control before using it. APP can be download by scanning the OR code on the camera users' manual. Package List: 1 * Digital Video Camera 1 * USB Cable 1 * HD Cable 1 * Hand Strap(already installed on the camera) 1 * Remote Control 1 * Camera Battery(already built-in camera) 1 * Lens Cap(already installed on the camera) 1 * Camera Bag 1 * Camera User Manual (English)"
Foto&Tech Exact Fit Hot Shoe Cover Cap Spring-inset allows exact-fit slide-on. It fits most cameras and help to keep moisture and dust from the hot shoe, which can affect flash performance. But even more so, it will help to keep the metal flanges of your hot shoe from getting bent down if your camera takes a hard bump when you're out shooting. That can be a costly repair, this tiny purchase can go a long way in saving you money in the future. And this simple little accessory is like having a bit of extra security for protecting your camera. 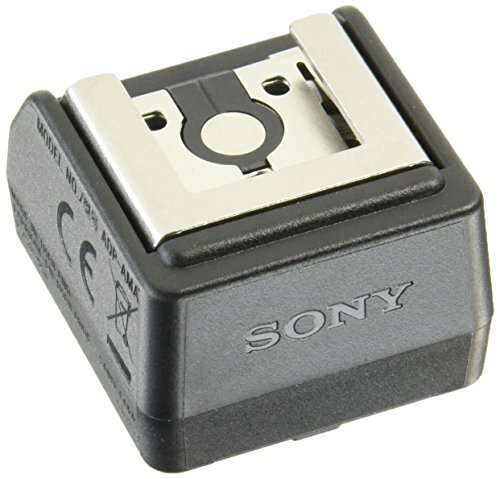 These will fit any camera with a standard hot shoe including those from Canon, Panasonic, Olympus, Pentax, and Nikon.